Creative has unveiled its latest personal media player the Creative Zen X-Fi. 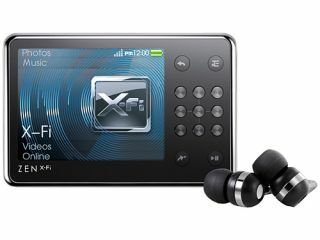 The X-Fi is a Wi-fi capable PMP with a 2.5-inch LCD, FM Radio and, shock horror, a decent set of headphones – Creative's EP-830 earbuds. Creative haven't scrimped on a whole range of accessories, from docks to cases, and its release in Singapore suggests that it won't be too long before it makes a bow in the UK. The X-Fi comes in 8, 16 and 32 Gig varieties, costing S$229, S$329 and S$399 respectively. In the unlikely event of those prices corresponding to the UK versions, that is £111, £122 and £138 – but as usual the chances are you can add on a bit and then double it before you arrive at the truth.